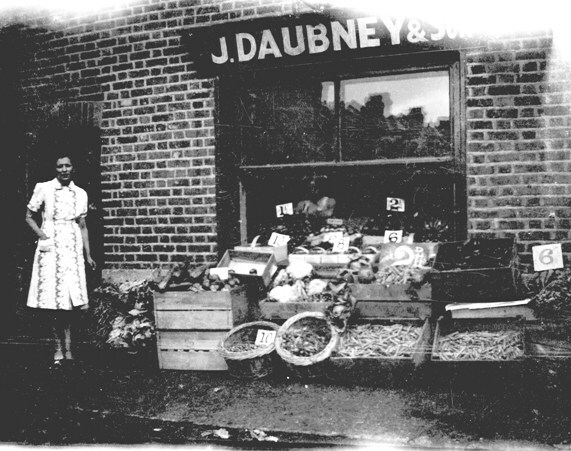 Samuel Day has provided this photo taken by his grandfather, James DAUBNEY, who ran a greengrocers shop on Albany Road during the 1950s. The lady is 'Win' Daubney, wife of James Daubney: they married locally in 1936. The display contains some vegetables at 2d (less than 1p) - I think for a pound (450 gm). Wooden boxes and wicker baskets contain produce which seems to be mainly veg. Win's dress suggests the photo was taken in the summer.